California Coalition for Families and Children, PBC « Parents' and Children's Resource for Child Custody, Divorce, Family Law, and The U.S. Constitution. "Justice, Mercy, and Faith"
California Coalition is grateful that the materials we’ve made available at Weightier Matter have been well-received by so many families and children who have been harmed by Family Court professionals. Among the hundreds of emails and phone calls we receive each month, the most common question is “how can I file a RICO action in my jurisdiction?” It’s a great question, and we’re eager to help, but unfortunately the answer is complex and depends greatly on factors unique to each jurisdiction. Therefore, our ability to give firm guidance is usually limited. However, there are some common suggestions we can pass along to you based on our experience to date. What can you do to bring a RICO action in your jurisdiction? Here are a few tips. While any individual can bring a RICO lawsuit, we suggest that potential RICO litigants consider finding other like-minded families within your jurisdiction (i.e., state or county) who can help with the grass-roots work. RICO and civil rights conspiracy cases are enormously complex, requiring pleading detailed facts to support claims describing the inner-workings of your jurisdiction’s Family Courts, lawyers, psychologists, social workers, and other related professionals. We have seen many parents attempting to fight alone fail. Organizing with others has many benefits that help you avoid common pitfalls. Groups Can Generate Spirit–and Evidence of Crime! one facet of the Family Law Community. By reaching out to others to form groups, litigants can “share notes” to find common illegal practices, bad actors, veiled relationships, and systemic behaviors that support RICO elements of enterprise, scheme to defraud, quid-pro-quo, and conspiracy. Litigants’ pooled knowledge can enable collection, analysis, and recordation of the foundation of a viable lawsuit. February 6, 2015—San Diego, CA—California Coalition today announces filing of its Reply and Response Brief in the United States Court of Appeals for the Ninth Circuit. In its brief, California Coalition responds to the fourteen Answering Briefs of Family Court judges, psychologists, divorce lawyers, social workers, and others within the Domestic Dispute Industry. 7. Family Court judges and others filed improper “cross-appeals” that should be dismissed. Details of California Coalition’s analysis in its Opening Brief is here. Today, the Sacramento Bee’s Dan Walters, dean of the state’s political reporters, released a brief video commentary on the State Auditor’s review of Judicial Council/AOC spending. He lays out in direct language that what the Alliance has been saying for years is correct: The bureaucracy is bloated, its employees are overpaid, and the Judicial Council has failed to do its job. For those of you with problematic browsers, a transcript of his remarks follows. Thank you for participating in our family law reform enterprise. By purchasing equity in California Coalition for Families and Children, PBC, you have made a critical contribution to what we believe is a history-making achievement in the improvement of outcomes for families and children throughout the United States in the crisis of a domestic dispute. Our litigation, online resources, and professional network is a major advance in the evolution of family law, judicial accountability, and legal ethics. We are honored to have you as a shareholder, colleague, and partner in our journey. October 23, 2014—San Diego, CA—California Coalition for Families and Children, PBC, today announces filing of its Opening Brief with the Ninth Circuit Court of Appeals in California Coalition for Families and Children v. San Diego County Bar Association, Case No. 14-56140. In the appeal, California Coalition asks the Ninth Circuit Court of Appeals to reverse rulings of the United States District Court for the Southern District of California made in July of this year. California Coalition is advancing three arguments critical to families in domestic disputes. California Coalition is asking the Court of Appeals to reexamine a critical 1986 case that extended broad judicial immunity to judges accused of wrongdoing in office. The case, Ashelman v. Pope—under which family court judges today receive absolute immunity for any act done in their “official capacity”—was decided inconsistently with a prior 1978 United States Supreme Court case, Stump v. Sparkman. California Coalition offers the Court of Appeals a meticulous analysis of the history of judicial immunity from the seminal 1872 case of Bradley v. Fisher, and its Twentieth Century progeny of Pierson v. Ray, Monroe v. Pape, and Pulliam v. Allen, explaining that the Ninth Circuit’s decision in Ashelman betrayed the Supreme Court’s instructions to examine whether a judge was performing a “judicial act” that was immune as of 1871—when the Civil Rights Act was passed into law by Congress. From California Coalition’s litigation library this week we bring you the inside word on custody evaluations from judges, lawyers, and evaluators themselves. When is a custody evaluation legal? When is it appropriate? When should it be ordered? What is the policy of courts in making these decisions? 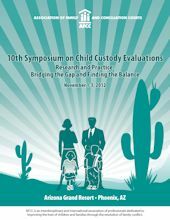 Three Los Angeles Family Court practitioners explain their policies and practices at the 2012 10th Symposium on Child Custody Evaluations in Phoenix. The audio is linked below. If you’ve been told or otherwise believe child custody evaluations are well-studied, regular processes–like an operation or physical therapy–what you’re about to learn will amaze you. California Coalition’s complaint in its racketeering lawsuit against the San Diego County Bar Association and its divorce lawyer subsection details the collaboration between San Diego divorce lawyers and the City Attorney’s office in prosecuting critics. Below we excerpt sections of the complaint detailing the prosecutorial misconduct of Assistant City Attorney Emily Garson, under supervision of City Attorney Jan Goldsmith, in their illegal prosecution of Colbern Stuart, President of California Coalition. The City Attorney spent tens if not hundreds of thousands of dollars prosecuting Stuart, an accomplished civil litigator having worked for major international law firms in federal court trials and appeals for nearly two decades, for a speech misdemeanor: “annoying electronic communications.” Stuart was charged for “annoying” his ex-wife by attempting to set up phone contact times with his son. The City Attorney’s prosecution was largely a failure–Stuart was acquitted for most of the charges, convicted only for emails in which he “cursed” in frustration at his ex-wife’s obstructive behavior. To prosecute Stuart, Garson and Goldsmith extended themselves to commit perjury, prosecutorial misconduct, and racketeering in retaliation for Stuart’s activities in leading California parents against divorce lawyers, psychologists, and judges which Stuart and California Coalition claim are defrauding and harming parents and children. The lawsuit alleges Garson and Goldsmith pursued Stuart’s bar license, costing him a lucrative career as a federal court litigator. Stuart’s lawsuit claims over ten million dollars in damages. Defending the lawsuit alone will cost city taxpayers hundreds of thousands of dollars, and the city’s exposure for a share of the damage to Stuart and California Coalition is staggering. “How anyone could have imagined a criminal prosecution for cursing in an email benefited anyone is a mystery” says Stuart. “Garson and Goldsmith destroyed my career, my ex-wife’s career, our son’s future, California Coalition’s momentum that we had achieved since 2008, and countless lost opportunities to help parents and children facing the enormously harmful treachery of divorce lawyers nationwide. Garson and Goldsmith are not merely foolish, they’re evil” says Stuart. The case is currently on appeal to the Ninth Circuit Court of Appeals. Hearing expected in late 2014.